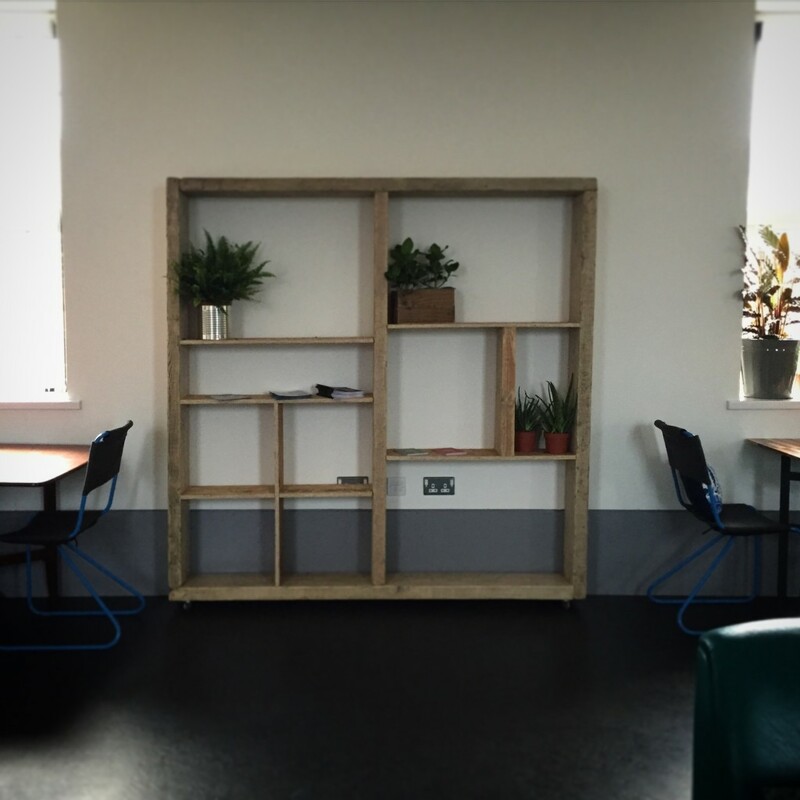 We’ve been hard at work on an exciting interiors project for the brilliant Eighty 81 Creative Workspace. 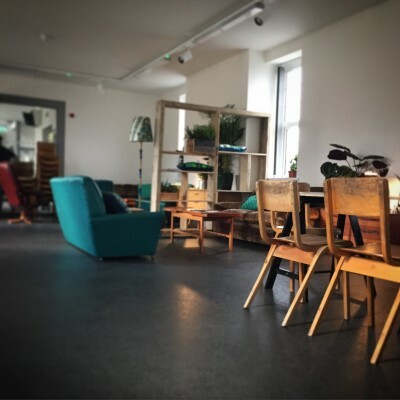 Eighty81 is a shared creative workspace managed by Blick Studios on behalf of Ilex Urban Regeneration in Ebrington, Derry/Londonderry. 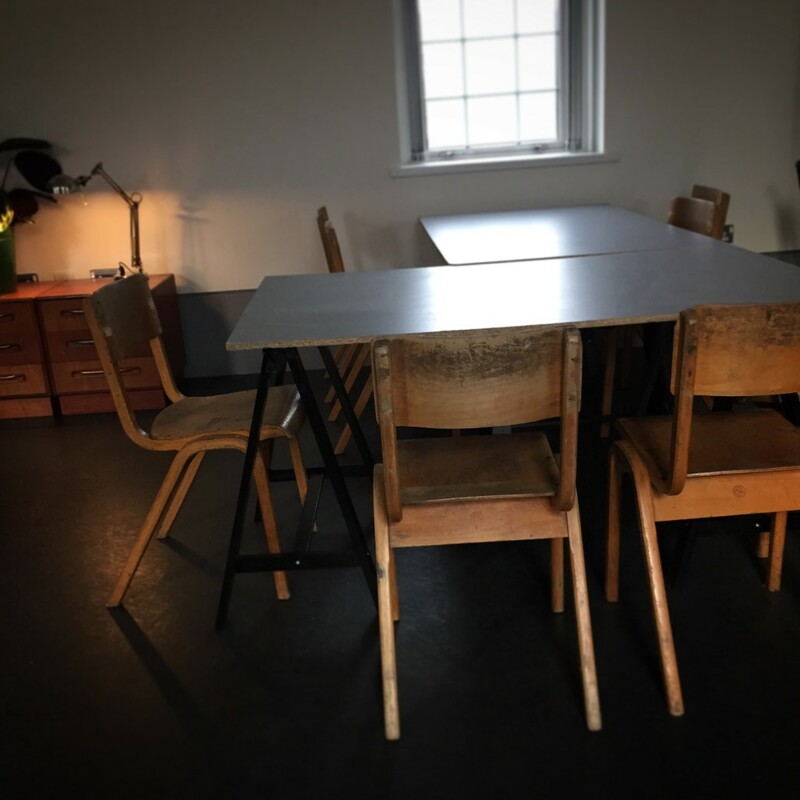 Eighty81 aims to create a supportive and inspiring work environment where creatives can meet and work alongside other like minded creatives and collaborate, learn, grow and develop their businesses. They are based in the building that held the 2013 Turner Prize, so we had some pretty big boots to fill! We worked with them to create a convivial and flexible common room, and to make their foyer and landings more welcoming. 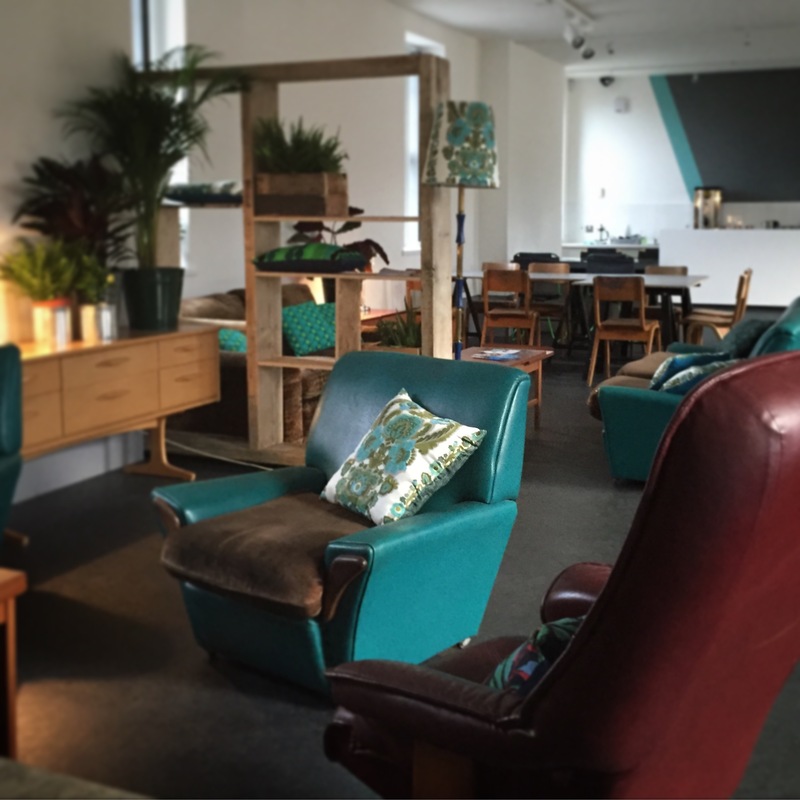 We used loads of gorgeous vintage pieces from here at ReFound, and our neighbours On The Square, bringing them all together with a 1960/70s scheme based around brown, blue and teal shades, and lots of fantastic wood textures. 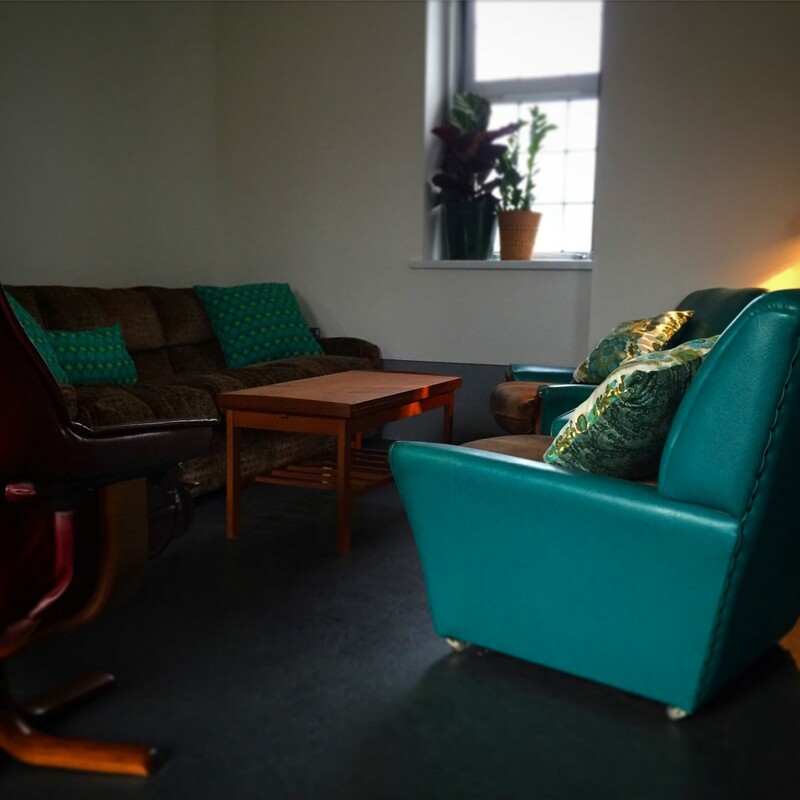 We made lots of bespoke cushions to create a flow of colour and cozy-up the space, and even some created some bespoke lighting. 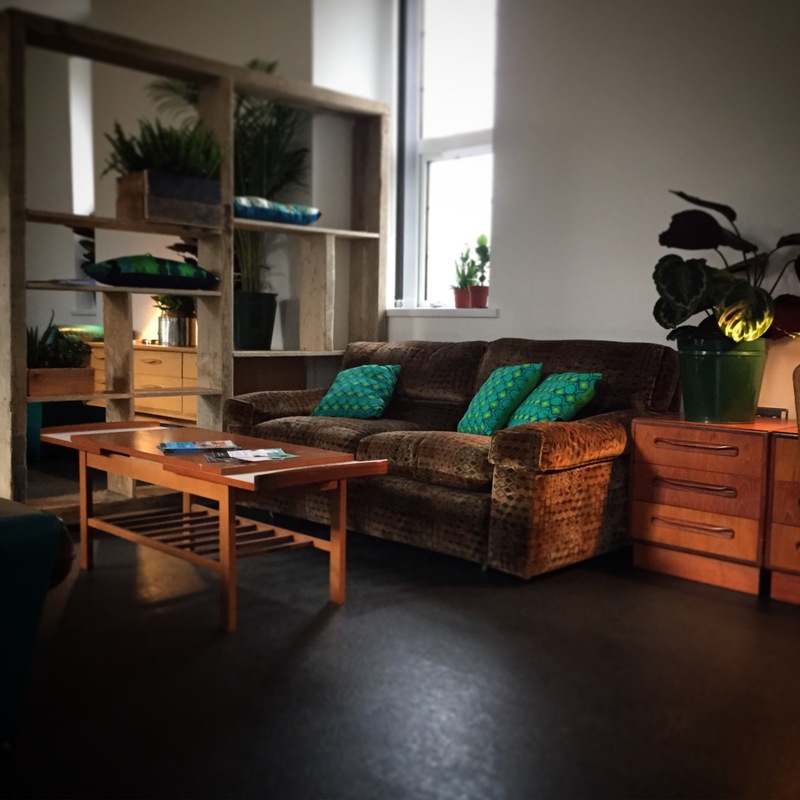 The fifty plants we put into the space not only provide gorgeous green eye-candy, but proven health benefits to the users of the space. We were sad to say goodbye to them! We also designed two matching moveable room dividing shelf units, using scaffold planks and industrial OSB*, in order to break the large, long room into more intimate areas. We’re never afraid of mixing it up style wise here at ReFound, and we think that this more industrial aesthetic works impressively with Mid-Century! Another wood texture we used was recycled laminate chipboard, for adaptable trestle tables. We left the edges raw to tie in with the larger texture of the OSB in the room dividers, and paired them with lovely worn old school chairs. 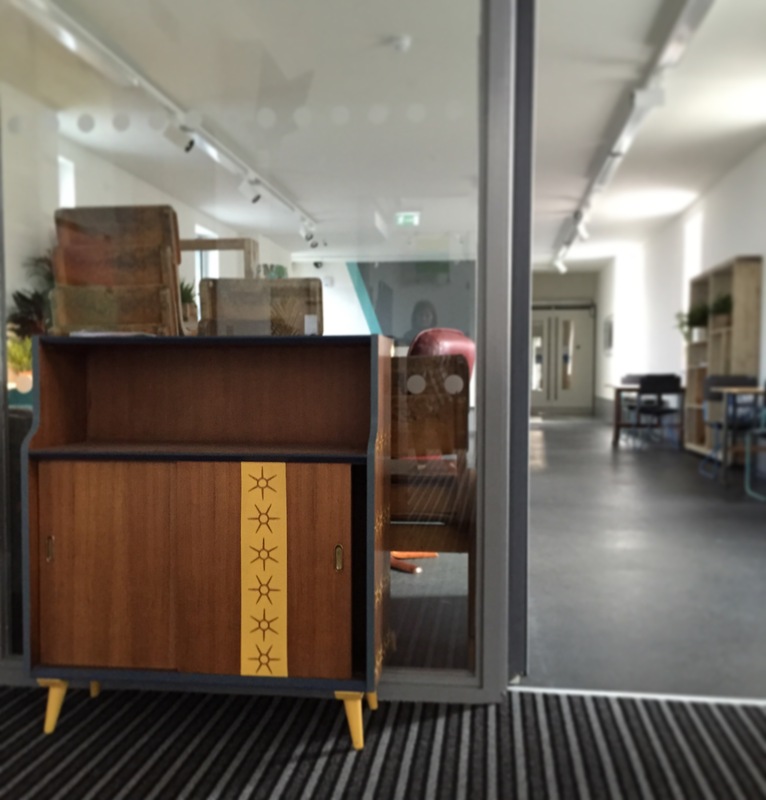 This lovely little painted Mid-Century cabinet greets visitors in the foyer. We loved working with Eighty Eighty1, and we love getting the opportunity to transform a space! *OSB, to the non building materials obsessed, is oriented strand board: giant textured chipboard.